Cork City’s hopes of reclaiming the SSE Airtricity League Premier Division title suffered another huge setback as they were beaten Bohemians at Dalymount Park on Friday evening. 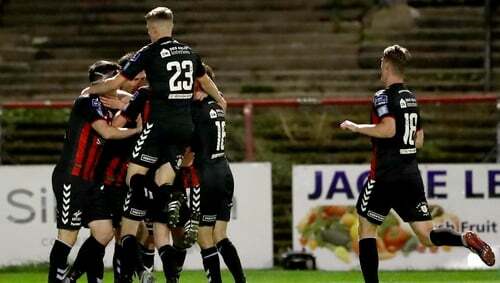 A superb brace from Danny Kelly inspired Bohs to their sixth league win in a row to leave the Champions languishing six points behind Dundalk at the top of the table having now played a game more. Keith Long made one change to his side which impressively defeated Derry City 2-0 at the Brandywell in their last outing two weeks ago as Paddy Kirk came in at left back in place of Darragh Leahy. Looking to make it seven wins on the bounce in all competitions, Bohemians started confidently and they went close to taking the lead in the opening minutes. A stray pass from the City defence allowed Keith Ward to fire an early warning towards the visitor’s goal but he dragged his shot well wide of the target. And the home side took the lead in the tenth minute in extraordinary circumstances. There appeared to be no danger to the Cork defence but Damien Delaney inexplicably drilled his back pass across the face of goal and into the far bottom right corner of his own net. John Caulfield made three changes to his side which suffered a shock 2-1 home loss to Sligo Rovers in their last appearance in the league with Jimmy Keohane, Steven Beattie and Peter Cherrie replacing Garry Buckley, Johnny Dunleavy and Mark McNulty. The Double winners almost hit back immediately but after superbly controlling Conor McCormack’s searching crossfield pass, Karl Sheppard blasted his half volley inches wide of the near upright. That near miss proved decisive as Bohs doubled their lead midway through the half thanks to a stunning solo effort from Daniel Kelly. Running at pace, the attacker burst through Aaron Barry, skipped past the leggy Damien Delaney before coolly slotting the ball past the keeper and just inside the far post. Delaney’s evening continued to get worse as he was again at fault as the Gypsies added their third with a half an hour on the clock. The former Crystal Palace centre back lost possession which allowed a gracious Keith Ward to play in Kelly with a sumptuous through ball and he made no mistake, blasting his second past Cherrie at his near stick. The Leesiders snatched a lifeline moments later when Graham Cummins expertly headed Steven Beattie’s cross into the top right corner from close range. But the reprieve was all too brief as the Dublin Club restored their three goal lead in first half injury time thanks to Derek Pender. The captain followed his pass towards Kevin Devaney on the edge of the box before collecting the breaking ball and tucking it past Cherrie with ease. Cork gained some sort of composure at the beginning of the second period and they made it 4-2 in the 57thminute when Jimmy Keohane nodded Karl Sheppard’s cross into the roof of the net. The visitors pressed forward in search of an unlikely comeback as they game drew to a conclusion with Gearoid Morrissey and Graham Cummins seeing headers drop just wide of the goal frame. But it wasn’t to be Cork’s night and they now need a miracle in their remaining five games if they are to win the title while the result sees Bohs climb to fifth, ahead of St Patrick’s Athletic who travel to Sligo Rovers on Saturday night. BOHEMIANS: Shane Supple; Derek Pender, Dan Casey, Ian Morris, Paddy Kirk; Keith Buckley, JJ Lunney (Andy Lyons 89); Daniel Kelly (Eoghan Stokes 92), Keith Ward (Oscar Brennan 75), Kevin Devaney; Dinny Corcoran. CORK CITY: Peter Cherrie; Steven Beattie, Damien Delaney (Conor McCarthy 45), Aaron Barry, Shane Griffin; Conor McCormack (Shane Daly-Butz 85), Jimmy Keohane, Gearoid Morrissey; Barry McNamee (Josh O’Hanlon 71), Karl Sheppard; Graham Cummins.